The 2017 Gemini horoscope predicts that there will be slow changes during this year, which will make it easy for you to keep up with. Try to reduce your stress levels as much as possible. This will help to keep your mental health in peak health just like your physical body. Try to be as optimistic as possible during this year. Your positive vibes will make life blissful. The more cheerfully that you think about the future, the more likely that you are going to have a good time. The 2017 forecast for Gemini asks you to use your free time to advance as a person as well. While you can focus on work all year, you can also use your time to do the things that you love instead. Your year 2017 depends on your actions, so make the most of it! Life can be complicated at times. What will happen in the upcoming year? 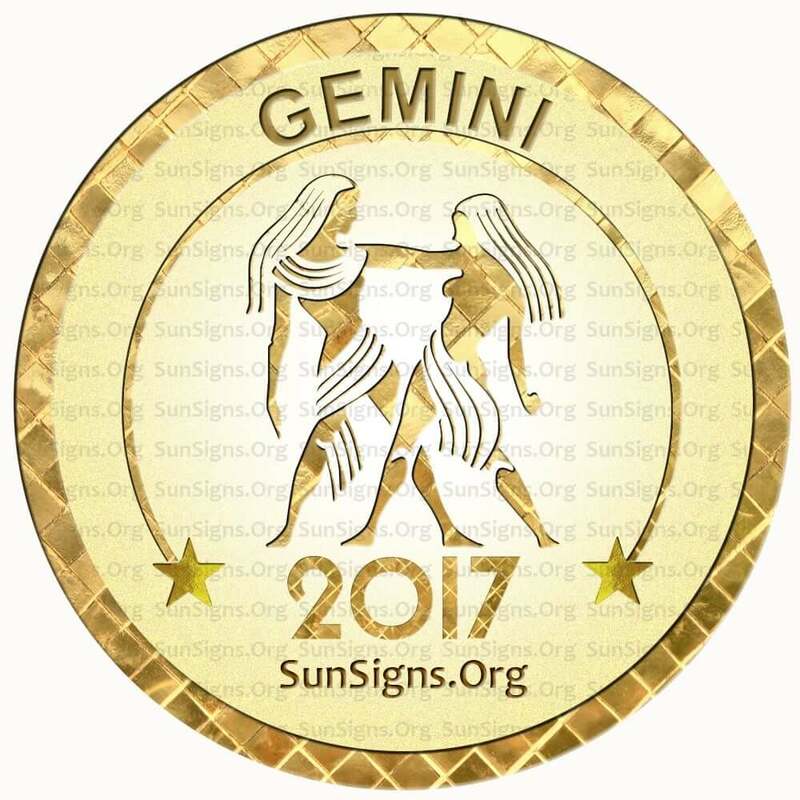 It can be hard to guess, but with this 2017 horoscope for Gemini zodiac sign you can be more confident in your future. You are a Gemini if you were born between May 21st to June 21st. (Read about Gemini birthdays). Many people tend to see the Gemini as a salty sign with not much to offer. But if they looked closer they would see all the great Gemini personality traits. If you didn’t already know, Gemini tends to be a highly intelligent sign. If you have a question, don’t be afraid to ask a Gemini man or Gemini woman. While Gemini star sign sometimes has trouble making friends, they are great friends once they do get one. They are shy around strangers, but they are well spoken and funny around friends. They may not be the most consistent astrological sign, but this is how you know that there is never a dull moment with a Twin. The Gemini love horoscope 2017 says expect to see a boost in your relationships, both romantic and friendly. This is an especially good time for love if you are not currently in a romantic relationship. Don’t look at friends for romance. Your new love is more likely to be with someone new than someone you already know. Don’t be afraid to step outside of your comfort zone. The more new places that you go to, the more likely you are to meet someone new in 2017. The Gemini star sign 2017 predictions also foretell that once you find the one for you, it might even seem like an instant attraction. You are likely to have a new, exciting and sexually passionate relationship. This is a time for new and exciting things, not the routine. This leads to what will happen if you are already in a relationship. Expect the unexpected! Maybe even a baby or news about pregnancy! Gemini, new spice will come into your relationships this year. You may be very nervous about all of these relationship changes, but they are all for the best. You are also likely to meet new people this year who will make great friends in future years. Have a nice year! As financially the Gemini star sign people will be stable in 2017, this can help to take a lot of stress off of your mind. This will give you more mental energy to focus on the things that you love. Just as well, your work life is bound to be less stressful as well. Work might seem slow for the Gemini sun sign in 2017. But this means that it will be easier on you as well. The horoscope 2017 for Gemini foretells that you can work on things that will help you to advance in your career in your spare time. This will make you seem more important at work, leading to success in future years. The 2017 horoscope predicts that the Gemini zodiac people will be careful with money in the coming year. All financial decisions will be taken after a lot of thought. You will re-plan your wealth management and invest where you are sure of a profit. In previous years, you may have felt like your bank account records were all over the place. Luckily, the Gemini 2017 career forecasts suggest that this year finances are more likely to stay relatively stable. The Gemini 2017 predictions suggest that your physical health will be at its peak in 2017! Your body will be like a finely tuned machine. It’s highly unlikely that you will suffer from more than a common cold during this year. You should use your healthier body to make yourself even better. Since you are healthier you are bound to get more sleep and have more energy because of it. Good health doesn’t last forever, so cherish it while it lasts. One downside to your health this year is your mental health. Be mentally active if you want to have a good future. The 2017 Gemini astrology predictions ask you to use your excessive energy to exercise and prepare your body for future years. Try not to let the little things bog you down too much during this year. Work and friends might stress you out at times, but don’t look too deep into it. Gemini, stay optimistic at all possible times in 2017. January 2017 is a favorable month for the Geminis. Clean your house and mind so that you can start the year on a fresh note. February 2017 is a busy month for the Twins. Learn to delegate work at your job so that you get less stressed. March 2017 shows miscommunication with family. Romance in marriages will improve. April 2017 shows your inclination for online dating and trying your hand at a new Internet business. May 2017 is when you will try to evolve. This might just mean a makeover or a new identity. June 2017 shows problems in Gemini relationships. But pregnancy related news will be positive. July 2017 yearly predictions shows that your professional woes will come to an end. Enhance your health by using these health benefits. August 2017 Mercury retrograde in 2017 will have a negative effect on your family relationships. So be prepared to fight it out! September 2017 is a good month to give up your drinking addiction and other substance abuse. October 2017 might be the right time to become serious about your lover. The 2017 yearly Gemini horoscopes also ask you not to forget to enjoy life. November 2017 is a month when nothing might work out in your favor. But in fact it is helping you become stronger. December 2017 shows what you want from your job. You might be tempted to lose weight by wrong means. Overall the Gemini horoscope 2017 predicts that this will be a stress free and peaceful year. Relax and have a good time.